There may be nothing more frightening than having a fire in your Tremonton home or business. Fire can spread quickly and can be very life threatening even if all the proper emergency procedures are followed. Once you have gotten to safety and you know the statue of everyone else in the building, you should act quickly to get your fire and smoke damage cleanup underway. Understandably, you may not have any experience with fire and smoke damage cleanup, most homeowners don’t unless they have experienced it before. The certified team of fire damage specialists at Sierra Restoration has compiled a list of reasons why you should act quickly after a fire has struck your home or business. You may not know that one of the major threats to the fire and smoke damage cleanup process is water damage. Fires leave a structure with weak spots and many times they extend to the exterior of the home or business. Windows may be busted or roofs may cave in and these both allow water to come in from rainfall. Of course, water damage can come from the fire retardants that the fire department uses to put it out as well. Though the retardants cannot be avoided, you can have tarps put up on the rooftops and particle board in the windows to ensure that the elements do not come in. It can be dangerous to put these up on your own, especially if you are unsure how sound the structure is, so you should call a professional cleanup crew to do this for you. Many people may not even consider that ash is acidic when they have fire problems in their home or business. So what does that mean? The longer that ash fire residue stay on surfaces, the more damage it can do. Ashes can corrode pipes and fixtures and should be removed as soon as possible. Even leaving ash for 48 hours can increase the damage that it can do. 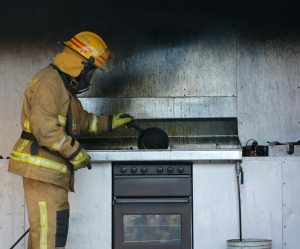 You might be tempted to wait until the next day to call a fire and smoke damage cleanup crew, especially if your emergency happens on a weekend, however the longer you wait, the worse the damage will be. Most fire and water damage restoration companies (Sierra Restoration being one of them) are open 24 hours a day, 7 days a week, or at least have an emergency hotline you can call. You will be able to spot most areas of fire damage within your home relatively easily. There will be stains on carpets and discolorations on walls, and of course burns and ash everywhere. However, you might not think about the soot that could be trapped in the HVAC system. The soot can continue to get into the air an cause respiratory issues if you don’t have these systems cleaned out. The soot can also land on surfaces after being blown through the ventilation system and continue to cause damage to furniture and flooring in your home. Most professionals will clean these systems, but just in case, keep your eyes open for signs of soot in your home or business when you start running your HVAC system again.